While Cement Creek continues to feed 585 gallons of acid mine drainage per minute into the Animas River, treatment to the mines above the river’s other tributary, Mineral Creek, have had much more favorable outcomes. Which begs the question: Why? 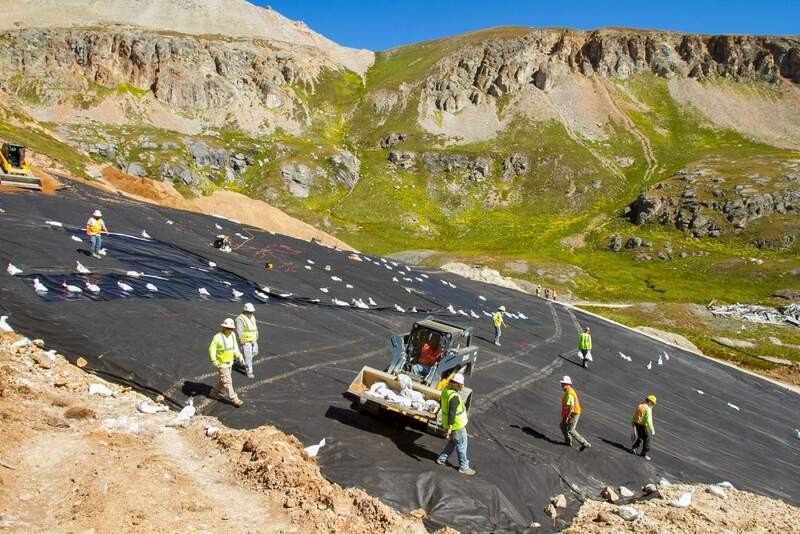 On Wednesday, a crew of more than 10 ﻿contract workers laid the last few protective layers of fabric, plastic and soil over a massive mound of mine waste under the Bullion King Mine, about 30 minutes north of Silverton in Porphyry Gulch. As the Environmental Protection Agency scrambles to stabilize the mine contamination north of Silverton, remediation work to the Mineral Creek basin has seemingly gone off without a hitch. Focus on the whole Animas River watershed started in 1994, with the formation of the Animas River Stakeholders Group – an unelected volunteer group of scientists, government employees and mining officials. Peter Butler, coordinator of the group, said at that time stakeholders looked at the whole basin as one to determine the worst sites contaminating the watershed and which ones were feasible to work on. The Bullion King Mine, abandoned since the early 1900s, ranked high on that list, but not because of leaky acid mine drainage. Instead, a massive 20,000-cubic-yard heap of waste left by miners was posing a major threat to the watershed because of its high metal content and low pH. When miners bored into the side of the mountain near Red Mountain Pass in search of valuable minerals, they took large amounts of ground out. Some of those piles contained metals of worth – such as gold, silver or ore – and were taken to a mill for processing. The vast majority pulled was of no monetary value. At that time, when the mining industry was largely unregulated, standard practice was to dump the waste in piles. The problem is, the heaps contain pyrite – the mineral responsible for acid mine drainage. When rain or snow moves through the waste and comes into contact with the pyrite – especially during spring runoff – it creates an acid runoff that can break down rocks and release potentially toxic metals, such as arsenic, lead and cadmium. It’s that mixture that can devastate aquatic life and endanger water quality. In July, crews started to level the lump of mine waste to reduce erosion and cover it with the protective layers. The project is funded by the EPA and multiple state, federal and local agencies, as well as private entities. Brown said by next summer, vegetation should begin to grow, and in the next few years, the landscape should blend in with the surrounding green. “It’s not a done project till something grows,” she said. Brown added the project is one of the last mine waste cleanup sites the ARSG targeted for the Mineral Creek basin. Sitting above the heap of mine waste is the portal to Bullion King Mine and, to the highly alert crew, its silent risk of a blowout. The mine, estimated to have about 10,000 feet of tunnels, leaks only about 10 gallons of acid mine drainage per minute. But because of mining practices of the day, an unknown amount of water is held back by a mound of dirt that has collapsed on the portal over the years. “Any time you have dirt holding back water, there’s always a chance for a blowout,” Brown said. The situation is eerily similar to what happened at the Gold King Mine. However, there’s one major difference: Crews at Bullion King Mine do not have the authority to work on the portal. Brown said because of issues with the Good Samaritan Law, it’s too risky to remediate the mine leakage. Only those with federal authority can do that, such as the case with the EPA’s work on the Gold King Mine. The cleanup at Bullion King Mine isn’t the only reason Mineral Creek runs clear while Cement Creek continues its tainted orange flow. Brown said a dozen other projects have been conducted in that watershed, but there are a variety of other factors caused by the natural landscape. The mountains around Mineral Creek do not have as high of concentrations of valuable metals, resulting in smaller mines and fewer waste piles – as opposed to the mineral-rich area above Cement Creek, which has a much more extensive network of mining. One mine that was leaking acidic waste into Mineral Creek at alarming rates was the Koehler Tunnel, which Butler said was every bit as bad as the contamination coming from Gold King and Red and Bonita mines. In 2002, a bulkhead was put in place, returning leakage levels to pre-mining days. “That bulkhead is almost solely responsible for the day-in, day-out better water quality in Mineral Creek,” Brown said. A bulkhead was thought to have worked for Sunnyside Mine, one of the largest mining networks in the Silverton caldera, above Gold King. But after the water table filled up, many officials speculate that groundwater sifted to Gold King, ultimately increasing pressure on the portal. Butler said that risk isn’t present at the Koehler Tunnel. Mineral Creek’s water-quality improvement is impressive. Since remediation began, there’s been a 70 percent reduction in zinc and copper, and a 50 percent reduction in cadmium. Officials have not seen a reduction in levels of iron and aluminum, and Butler said that’s mostly because of natural circumstances, not mining pollution. Those two metals are responsible for the absence of fish, but he said during spring runoffs, the water quality actually could support fish populations. However, despite success at Mineral Creek, Butler said water-quality levels in the Animas River have actually gotten worse in the past 10 years. Contract workers secure a protective layer over a mound of mine waste at the Bullion King Mine near Red Mountain Pass north of Silverton. The project aims to reduce erosion and runoff at the site by leveling and covering the waste. Eventually, vegetation should cover the site and blend in with the surrounding landscape. 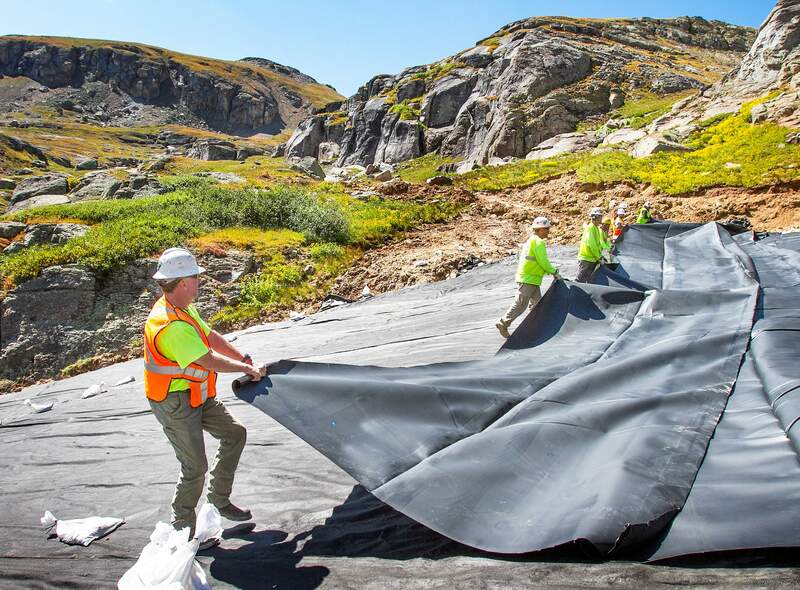 Shaun Stanley/Durango Herald Workers with Simbeck Liners of Mancos spread a rubber lining to cover the waste pile at the Bullion King Mine near Red Mountain Pass. 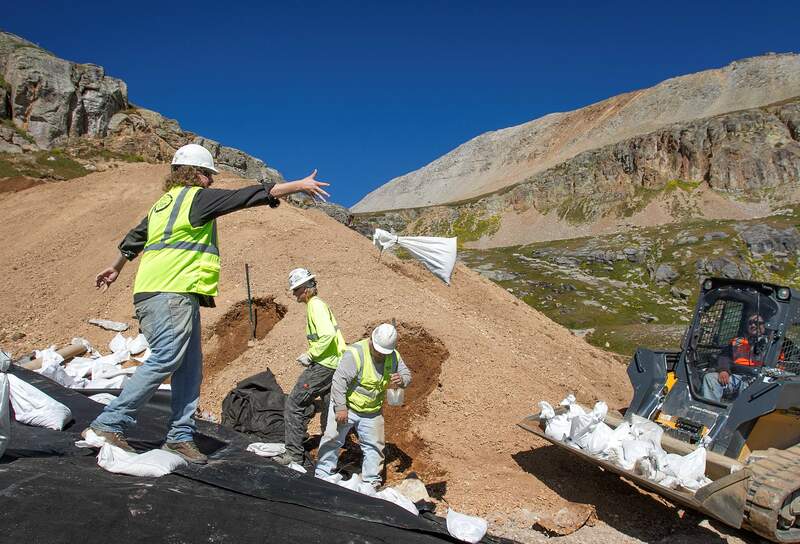 Shaun Stanley/Durango Herald Workers with Simbeck Liners of Mancos prepare bags of dirt that will help hold down a protective layer covering a pile of mine waste outside the Bullion King Mine.